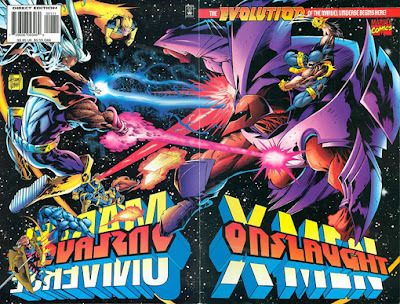 • ONSLAUGHT: X-MEN #1 "Traitor To The Cause"
• PLOT SUMMARY: Story continues from X-Men #54 and continues in Uncanny X-Men #335. The storyline that will change the Marvel Universe forever kicks into high gear! At the Xavier Institute in Westchester County, Onslaught (through the body of Professor X) reveals himself to the X-Men! The uncanny heroes are shocked and then overwhelmed by the powerful psionic entity! In an act of sheer desperation, Jean Grey rushes to the ZNox Chamber to call for help! But the awesome Onslaught cuts her off in mid-sentence! The X-Men will have to survive their first battle vs. Onslaught on their own! Cameo appearances by the Avengers, Fantastic Four, Franklin Richards, Juggernaut, X-Man (aka Nate Grey), and the Sentinels.